'Socially-Responsible Scientists or Soldier-Technicians? 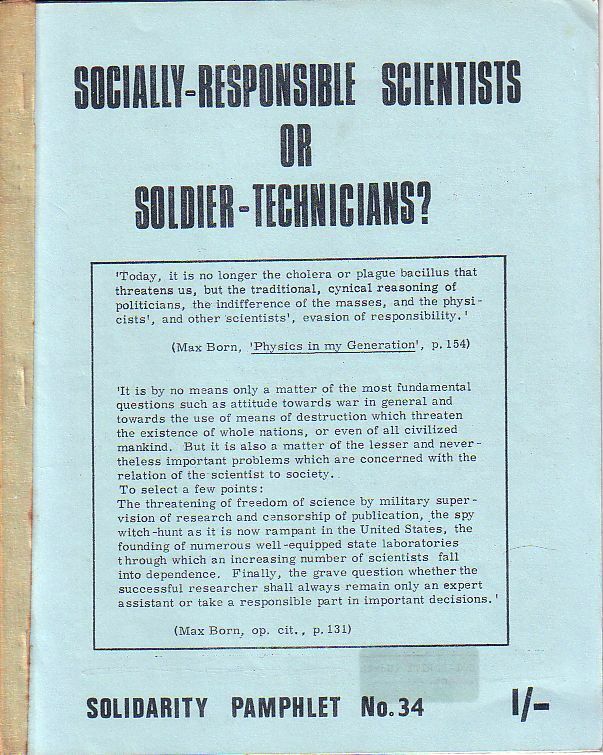 ', a working class critique of scientists at the time, was published by Solidarity in 1971. This was Solidarity Pamphlet 34. 'It is by no means only a matter of the most fundamental questions such as attitude towards war in general and towards the use of means of destruction which threaten the existence of whole nations, or even of all civilized mankind. But it is also a matter of the lesser and nevertheless important problems which are concerned with the relation of the scientist to society. Never before were scientists — both West and East — in such a deep moral crisis as today. Gone are the days when scientific research could automatically be equated with enlightenment, progress, pure knowledge. Gone are the days when scientists could consider their profession impartial, neutral and detached from social conflict. Gone too are the days when scientists could dispose of their particular responsibility by reducing it entirely to a question of political loyalties. The scientific community is far from being united in its attitudes to these problems. The following three articles 1 describe three conflict situations which took place in Britain recently. They illustrate a tiny sector of a much wider front. They do, however, highlight various views on the issue of the social responsibility of the scientist. They also demonstrate the use, by all those scientists who cannot resolve their conflict of loyalties, of a thick verbal smoke-screen concerning the 'social responsibility of Science' in general. These people, many of them members of the British Society for Social Responsibility in Science refuse to accept any code implying a personal responsibility of the scientist. In the following pages we propose such a code; we invite all those who reject it by arguing that 'it is too simple for dealing with a complex reality' to produce one of their own. The 'Scientists' Pledge' proposed in these pages is more than just a valid code for socially-responsible behaviour among scientists. It provides a yardstick against which every other proposed code can be measured. One can take it or leave it, but one must still relate to it. And in doing this, one's own assumptions will be exposed. Some unscheduled explosions shook the quiet city of Durham during the afternoon and evening of Sunday, September 6, 1970. At a marathon teach-in, catalysed by activists of the British Society for Social Responsibility in Science (BSSRS) a campaign was launched which has already embarrassed the authorities. This campaign could have far-reaching repercussions. Let us start at the beginning. The Durham 'happenings', which provided much copy for both the local and national press, were planned to coincide with the annual jamboree of the British Association for the Advancement of Science (B.A.). The B.A. is a conservative and complacent body of Establishment scientists, content over the years in presenting scientific advances to the public, with only ritual attention to their social consequences. The teach-in, on September 6, was devoted to the general theme 'Science is not neutral'. It attracted a remarkably mixed audience and 'proved to be undoubtedly the most unusual meeting in B.A. history. In order not to inhibit discussion Professor Felix Pirani of Kings College, London, who chaired the meeting said that "there was only one rule: one person speaks at a time". Then, without encouragement, began a freewheeling talkathon and "happening" which lasted for seven and a half hours without interruption and without any formal lecture. The size of the audience fluctuated from about 150 to 50 but about 200 regular B.A. members must have passed through. The range of participation included past B.A. president Dame Kathleen Lonsdale, both academic and Civil Service scientists, science students, local Durham folk and — not through their choosing ~ the press. Since everything was questioned at a basic level even a press representative was grilled about his motives after someone objected to having his photograph taken. What the New Scientist didn't report was that the teach-in was also attended by some mysterious gentlemen believed to be 'delegates' from MI5 and the Special Branch. They seemed concerned at the implications of a widely distributed leaflet, produced by a group of BSSRS radicals active In various fields of science. The leaflet is reproduced in the box below. The second clause, later overwhelmingly accepted by the meeting, was to become known as the Durham Resolution. 1. Not to use my scientific knowledge or status to promote practices which I consider dangerous. 2. Not to conceal from the public any information about the general nature of my research and about the dangerous uses to which it might be put. 3. Not to conceal from the public any information about the real identity — and degree of public accountability — of those who finance or control my research. 4. To exp1ain to the public the general nature and possible uses of research conducted by private or State bodies over which there is little or no public control. 5. To warn the public about such organisations as conceal information about the possible dangerous outcome or uses of their research. I consider it my duty, as a socially responsible scientist, to honour this pledge, whatever the personal inconvenience or risk involved. Many interesting points emerged dramatically during the teach-in. Mr J.C. McLauchlan, Chairman of the Institute of Professional Civil Servants claimed that there was nothing derogatory 'in a democratic society' for a scientist to be employed by the government on secret work. These people were 'soldier-technicians' and this was an honourable occupation. The newly-coined term quickly caught on. We should hear it a lot in the days to come. Philip Corrigan, lecturer in Information Science at Newcastle Polytechnic pointed out that a significant amount of Defence research was going on in British universities. At Southampton University for instance such 'soldier-technicians' were doing nerve gas research. Dr Jerome Ravets, senior lecturer in the History and Philosophy of Science at Leeds University pointed out that in Japan any physicist working at a Defence Establishment was not allowed by fellow-scientists to present papers at scientific meetings. At Japanese universities, military personnel sent to do post-graduate physics were automatically failed by their professors. He defined a 'soldier-technician' as 'someone who had violated the basic ethical code of scientists which is to share knowledge for the benefit of mankind. Those who are soldier-technicians rather than scientists, even if they are university professors and Fellows of the Royal Society, will have to make their status clear to themselves, their colleagues and their students'. We thoroughly endorse these definitions and suggestions. We moreover urge our friends and supporters in the universities to insist on knowing whether any of their teachers are 'soldier-technicians', i.e. whether they are engaged in work covered by the Official Secrets Act. Soldier-technicians should, after all, be granted their due. Perhaps they should be saluted as they entered and left lecture halls or strolled along in the groves of Academe. In a dramatic confrontation, Professor Ziman, of the Physics Dept, at Bristol University (a leading official of the B.A.) was asked about some of the disclosures made during the Aldermaston March of 1963. As revealed to a very wide public by the Daily Telegraph (April 19, 1963) — hiding behind Prague Radio (itself echoing the Spies for Peace) — certain leading Oxbridge and other scientists had, together with top military and Civil Service brass, been selected for survival in underground bunkers known as RSGs (Regional Seats of Government). From there, they would rule what was left of Britain after a nuclear war. 6 Professor Ziman was asked whether the B.A. had been a party to this selection. Did its leading officials know that from among their own ranks some had been chosen for survival while others had been written off? 7 Would the B.A. make a pronouncement on the matter? The question remained unanswered. The climax of the teach-in was undoubtedly its last few minutes, before a vote was taken on what later became known as the Durham Resolution. Mr McLauchlan (of the IPCS) said that in his opinion 'the terms of clause 2 of the Scientists' Pledge could not be accepted by anyone subject to the Official Secrets Act (would acceptance amount to mutiny among the soldier-technicians? ) or the terms of clause 4 by any scientist working in competitive industry'. 8 He was contradicted by Dr Kenneth Mellanby, Director of Monks Wood Experimental Station, who said that he too was a member of the Institution of Professional Civil Servants and that he saw nothing objectionable in the resolution. Amid increasing excitement clause 2 of the Pledge was put to the vote and carried by a large majority. The Annual General Meeting (AGM) of the British Society for Social Responsibility in Science (BSSRS), held on November 14, 1970 in Oxford, proved to be Act II of a drama that had opened with the Durham Teach-in, early in September. After 7 hours of completely uninhibited discussion, the Teach-in had accepted a resolution calling upon scientists 'not to conceal from the public any information about the general nature of their research and the dangerous uses to which it might be put'. Though many practising scientists had voted for that resolution a minority had tried to prevent a vote being taken. When defeated they had preferred to abstain from voting on the issue itself rather than vote against it. The Teach-in had been sponsored by BSSRS — the resolution itself had not. It was only natural that BSSRS would at some stage have to clarify its own stand on this matter. And so it did. Things had been happening between the Durham Teach-in and the AGM in Oxford. The 'New Scientist', which had hailed the Durham Resolution, came under pressure from scientists opposed to it. J.C, McLauchlan, Chairman of the Institution of Professional Civil Servants, wrote that 'the pledge could only antagonise a large body of practicing scientists, and so tend to defeat the objects of the society'. (New Scientist, Sept. 17) He had in mind scientists working under the Official Secrets Act, as well as those who work in 'competitive industry'. On October 22 'New Scientist' had published a long article by Professor Sir Ernst Chain, FRS. Under the title 'Social Responsibility and the Scientists', Ernie had spelled out in clear and unambiguous terms the credo of Establishment scientists (alias 'soldier-technicians'), 'The first responsibility of a scientist is to the nation of which he is a member. It is quite obvious that the very nature of the development of war weapons is such that the results of this research must be kept secret from the enemy. . . . This applies to defensive methods as well as to the aggressive methods ... Secrecy is also essential in industrial organisations as these are the producers of wealth for the nation. As long as patents exist ... discoveries of economic importance made in industrial laboratories must be kept secret'. Ernie then posed the question whether the university scientist should be involved, in times of peace, in secret work directed towards the development of war technology. His answer was 'no'. But '...not because of moral considerations, not because such activities are incompatible with the responsibilities of scientists towards mankind, but simply because in university surroundings there is not sufficient security to keep important discoveries secret'. To put it bluntly: 'The scientist working in a laboratory concerned with war technology who gives away secrets is a traitor'. (New Scientist, October 22, 1970). An actual case then cropped up. A Swedish physicist had developed a simple and cheap technique for separating isotopes, which would enable every ordinary physics laboratory to produce quickly large quantities of heavy hydrogen (the essential element of the H-bomb). The Swedish scientist, perturbed by the implications of his discovery, asked an official of the Pugwash Conference for advice. 'His attitude is in accord with the "Durham Resolution" adopted last month', commented 'New Scientist' (October 22). The scientist eventually decided to publicise his invention. The Guardian, commenting on this case on November 17, bemoaned the fact that 'the public is, in the matter of control, largely powerless'. Exactly. Who then is 'in control'? The Government? Parliament? Some obscure politicians? When it comes to financial and political decisions, perhaps. But not when it comes to the real business of carrying out scientific decisions. At the end of this particular chain of command, there is often a highly skilled and specialised scientist. So skilled, and so specialised, that without his cooperation the decisions often cannot in fact be implemented. Some of these scientists are intelligent and fully aware of the social implications of their work. Yet even those with purely technical minds — and they constitute the majority — hate to be labelled 'socially-irresponsible' by their neighbours or fellow scientists. They are highly sensitive to such a charge, probably because deep inside they know it to be true. It is precisely pressures of this sort that the BSSRS should be bringing to bear on various 'soldier-technicians' who try to evade their responsibility as scientists. But to do this the BSSRS would first have to make up its own mind whether it wanted to play such a role, whether it wanted to accept the 'Scientists' Pledge' (of which the Durham Resolution was but one point) — or whether it too would prefer to evade actual, real responsibility and smother it under heaps of words about responsibility in general. Some alarming signals had been detected in an earlier meeting of BSSRS, held in Imperial College in mid-September. The meeting had concerned itself with how to introduce the theme of 'social responsibility in science' into the curricula of universities and schools. The discussion had centred on teaching techniques, the subject matter of which was never defined. When a speaker was asked from the floor whether he visualised examinations in the subject, he replied: 'Why not?'. Could the speaker visualise a situation wherein someone got an 'A' in such an exam but later behaved in a socially irresponsible way? Reply: 'Why not?' After all we teach religion in schools yet don't necessarily expect those who study it to become religious'. Not one of the founding members of the BSSRS present in the hall challenged this view. These were ominous signs, foreshadowing the AGM. The AGM itself had three resolutions on its agenda. Two related to the Durham activities, and one to the organisational structure of the BSSRS. The whole meeting was as drab and formalised a ritual of institutionalised democracy as one can imagine. Only the lively chairing by Hilary Rose saved the few under-40s from dozing off. The meeting started with an audience of about 50. The organisational issue came up for discussion after an hour. The proposed resolution read: 'While recognising the importance of branches having considerable autonomy, the society asserts its belief that its effectiveness is proportional to its unity and that while a federal structure is desirable, the ultimate authority for the aims and policy of the society rests with the National Committee representing the National society'. This typical bureaucratic proposal, which anyone ever involved in direct-action activities could smell a mile off, was taken off the agenda, its proposals to be introduced bit by bit into the organisational rules. BSSRS discovered that, despite its fashionable name, it could not evade the conflict between the autonomy of the base groups (who act upon their own initiative) and the authority of the centre. The issue became urgent when a conflict of policy emerged between the London group of the founding members and some base-groups. It was amazing how people in the centre, some of whom are fairly experienced in left politics, still believe that they can stem the tide of direct-action of the base groups. As a matter of fact most base groups representatives did not turn up at the AGM. They considered the scene irrelevant. The 'centralising' measures were introduced with hardly a fight. A resolution was then voted upon, which was a veiled reprimand for those who had participated in the Durham events. The veil was so thick that the proposer had explicitly to spell out that the Durham activities 'alienated the goodwill of the public and many scientists'. The motion was carried. The crunch came when the BSSRS itself was confronted with the Durham Resolution, for which several of its leading members had voted a few weeks earlier. Adding insult to injury, the proposer of the resolution had the nerve to quote from the forementioned article by Sir Ernst Chain: 'The responsibility of the scientist is to warn his fellow men who have no scientific or technological knowledge of the dire consequences of modern war weapons, chemical, biological or ballistic explosives, conventional or thermonuclear. But he must do more. He must inform and warn society about the dangers of the pollution of air, soil and water through technological advances ... and altogether keep society constantly informed about progress in science and technology'. Surely, if Sir Ernst Chain considered it the scientists' responsibility to 'warn' and 'inform' the layman, an organisation called BSSRS could not fail to pass a motion calling upon scientists 'not to conceal' information from the public. But it turn out that things were not so simple. Professor J. Ziman (Physics, Bristol) stood up. He wanted to know whether the resolution was meant as a policy statement for BSSRS. Or was it a private statement by individual members? If it was meant as a policy statement, then there would first have to be a long, thorough discussion. And there was no place for such a discussion at the AGM. (Rather like the absence of time for fundamentals at meetings of the British Association?) Hilary Rose replied from the chair that while the resolution was being put forward by a group of individual members it was fully in line with the general policy of BSSRS and there was no point in making the distinction. She was immediately contradicted from the floor by her husband, Professor Stephen Rose (Biology, Open University), a co-founder of BSSRS. Professor Rose insisted that BSSRS had never accepted the Durham Resolution as its policy, nor did it intend to. Its aim was to spread the idea of social responsibility, not to define it or implement it within its own ranks. A vote was taken and the resolution was defeated. Some of those who had voted for the resolution in Durham — among them founding members of BSSRS — voted against it at the AGM in Oxford. It transpired that the BSSRS is not to be confused with a Society of Socially Responsible Scientists. Many of its members, at the Centre at least, have a limited view of the role of their society. The job is apparently to spread the general idea of social responsibility among scientists (while carefully refraining from clarifying its nature) and to keep members at all costs (i.e. not to lose those who signed the Official Secrets Act). It is, indeed, BSSRS Ltd.
Organisations of this sort are by no means unique nowadays. They represent a trend of the established social order to recuperate, neutralise, and absorb those internal social tensions which threaten the smooth functioning of its institutions. Modern industrial society depends on its scientists. Scientists cannot be made to work by coercion. If they start to doubt, opt out, or oppose their assigned role, it becomes imperative to create channels that will provide them with an outlet, without simultaneously endangering the functioning of the system as a whole. BSSRS is such an outlet. It is not a plot. It is an authentic expression of the conflict within some scientists, which is but an internalised version of the social conflict at large. Many members of BSSRS are liberal-minded. Some are marxists, others socialists of various shades. One of them defined his situation in Durham as 'a tragedy; it looked like the generation gap, and I was caught in the middle'. People who define an external issue as ' a tragedy' are merely projecting their own inability to resolve a conflict of loyalties. Tragedy has two elements: an inevitable development towards doom and a permanent struggle to overcome it. For some BSSRS members, having to face the alternatives of loyalty to the Official Secrets Act or loyalty to the 'Scientists' Pledge' is equivalent to doom. Others will welcome it. It will force them to gain insight into themselves and to make a choice. SCIENTIST'S DILEMMA: RESPONSIBILITY TO WHOM? 'The prospect is that perhaps by the end of this decade science will have learned how to transplant genes into a fertilised egg and create a number of genetically identical human beings, exactly as you would breed prize cattle ... To give only one example: the Government would be able to solve the problem of draft resistance in this country by breeding genetic copies of the ideal U.S. Marine. This is not nearly as absurd a prospect as most people think'. The man who spoke these words 9 was one of Dr Jonathan Beckwith's team at Harvard University who achieved a major breakthrough in molecular biology in 1969, namely the isolation of a gene. To breed prize Humans or not? For what purpose? What is a 'prize Human '? Who is to decide? Governments? Scientists? Politicians? Can we ignore these questions? Can we expect that somehow they'll fade away, or take care of themselves? Is all this mere phantasy of a youthful, overexcited mind? Far from it. To conceal information from the public? Or to inform the people? To rush ahead with experimentation and large scale implementation before the issue has been publicly discussed? To accept work under conditions of secrecy? Or to refuse to work under such conditions? Here are some basic issues of social responsibility confronting scientists today. A conference on 'The Social Impact of Modern Biology' was recently organised by the British Society for Social Responsibility in Science (BSSRS) in London. It was an attempt to air and discuss these issues in public. In calling and arranging this conference (which took place on November 26-28, 1970) BSSRS provided a forum for open discussion of problems and opinions which many scientists consider taboo. The arrangement of passing microphones in the audience so as to enable anyone to put questions to the speakers, or to express his own views, is strongly to be recommended. On average about 1000 people attended the various meetings. Among the scientists one could count at least 4 Nobel Prize winners. Their statements, like those of everyone in the audience, reflected the fact that science, as a form of human endeavour, was in its worst crisis ever. Everyone agreed that it was no longer possible to ignore the social responsibility of the scientist. But here the differences appeared. Some argued that a scientist's responsibility is to 'his nation'. Others claimed that a scientist has no more responsibility than, say, a bank manager. Some reduced social responsibility to political responsibility. They would be willing to do in the East what they were unwilling to do in the West. Some, like J. Monod, argued that science must generate from within itself its own 'scientific' moral code. Others argued that the prevailing ideology conditions the scientific categories themselves. Some wanted scientists to become autonomous decision-makers on all matters related to science. Another group openly advocated misleading the politicians in order to obtain funds. There were as many differing, and mutually antagonistic, opinions as there were speakers from the platform — and from the floor. There was not one speaker from the platform — including the Nobel Prize winners — who was not challenged from the floor. A few years ago no layman would have dared publicly to question the moral assumptions of scientists speaking on their own subject, and no Nobel Prize winner would have reacted hysterically when his motives were challenged. He could have afforded to disregard such challenges. Nowadays such challenges and responses are no longer unique. Scientists today, especially younger ones, question the motives, assumptions, values and priorities of their elders. There is a generation gap within the scientific community just like everywhere else. There are of course many complaisant careerists among the younger generation too. But they can no longer refer to their motives (money, fame, easy job, sheer curiosity, 'search of Truth for Truth's sake', etc.) as 'obvious', 'natural', and 'normal'. All this is questioned and challenged — in public — by fellow scientists. All this exploded in the conference. Today, the scientific community is gradually splitting up into two camps. Each has its own moral code. These two codes, which reflect a differentiation occurring in modern society at large, are not merely different. They are mutually exclusive, and cannot coexist. One side considers a scientist's first responsibility to be to 'his country', 'his firm', 'his personal well-being'. Or to 'Science itself'. The other camp considers itself responsible to the entire population of this planet, including the future generations. (This 'entire community of the planet' becomes very real when issues like radioactivity, manipulation of genetics, pollution, etc., are considered.) The first camp considers its adversaries as 'radicals', 'extremists', 'a risk to national security', whereas the latter consider the Establishment scientists as 'careerists', 'socially irresponsible scientists', and 'a threat to mankind'. According to Sir Ernst Chain' ('New Scientist' , October 22, 1970): 'The first responsibility of the scientist is to the nation of which he is a member ... this applies to the defensive methods as well as to the aggressive methods'. 'The scientist working in a laboratory concerned with war technology who gives away secrets is a traitor'. 'Secrecy is also essential in industrial organisations as these are the producers of wealth for the nation'. 'Should the university scientist be involved, in times of peace, in secret work directed towards the development of war technology? ... Should the university scientist cooperate with industry in research projects which, for the time being, must be kept secret? ... No. ... because in university surroundings there is not sufficient security to keep important discoveries secret'. No mincing of words here, but Ernie merely articulates what many scientists accept implicitly. Jonathan Beckwith, speaking at the BSSRS conference, saw it otherwise: 'I do not believe that the directions and applications, of this work (i.e. genetic engineering) should be decided by a group of 'prominent scientists' any more than it should be decided by a group of politicians. These are political questions that require a much wider participation in decision-making, a participation that our present system does not allow'. 'If the speed with which science is progressing must be slowed down in order to spread the benefits of science among all people, so be it'. 'The substitution of a scientific elite to make decisions instead of a political elite holds no greater guarantee for the wellbeing of mankind, A necessary step is for scientists to bring science to the people'. 'The view of science as a purely progressive force, the lure of prizes and many other factors, justify the most corrupting levels of competition ... the organisation of labs for the greatest efficiency leads to a degrading master-slave relation between supervisor, student, and technician. What benefit is a cure for cancer to man if in the process he is losing his humanity?'. Can someone with views like Beckwith's work with someone who upholds Chain's views? There are those who believe that such a collaboration is possible, if only because they themselves cannot resolve the conflict of loyalties. BSSRS itself is full of such people. They seek to avoid conflict by speaking in generalisations about social responsibility 'in science', evading the issue of the personal responsibility of the scientist. 'Science' is not responsible for anything. The scientist is. Those who prefer to sit on the fence love to refer to the classic example of the construction of the first Atom Bomb. 'Of course it was a tragic decision to make such a weapon. But what if the Nazis had made it first?'. 'Moreover it wasn't the scientists who decided to drop bombs on Hiroshima, and Nagasaki. Some, of them were against it. It was Truman's decision. It was the politicians, not the scientists, who decided'. We were offered this apologia for the umpteenth time by Nobel Prize winner J. Monod at the BSSRS November conference. He in fact used this example in an attempt to show that the 'Durham Resolution' was 'too simple to deal with the complexities of real life'. Some of us, however, challenged Monod from the floor: 'Germany surrendered on May 8, 1945. At that time scientists in the USA did not yet have the Bomb, The decision on how to use it was not. with the politicians for the simple reason that there was no bomb to decide about. It was up to the hundreds of scientists working in Los Alamos to decide whether to go on constructing the yet unfinished Bomb. Those who worked on, whether after conscious deliberation or just without considering the implications, cannot excuse themselves by referring to arguments of the 'Nazis might get it' or 'the politicians decide' type. Was not this an example of socially irresponsible behaviour?'. Jacques Monod squirmed, but finally he had to admit that these scientists had indeed behaved in a socially irresponsible manner. The 'Durham Resolution' states simply that : As a socially responsible scientist I hereby undertake not to conceal from the public any information about the general nature of my research and about the dangerous uses to which it might be put. There is nothing revolutionary, radical or extremist in its wording, yet it forces all those scientists who accept secrecy clause's as part of their conditions of work (and they constitute the absolute majority of those working for governments or industrial firms) into an 'untenable situation', as the BSSRS Newsheet put it ( January-February. 1971). Both the BSSRS Newsheet (loc. cit. ) and The Guardian (Sept. 10, 1970) have conjured up spurious arguments to alleviate the scientist's dilemma. How can scientists know that their work might be put to dangerous uses? They 'cannot conceal from the public something they simply don't know'. But what when they do know — as at Los Alamos for example? No wonder the Guardian moans that 'many scientists will not enjoy doing' what the Durham Resolution advocates. Secrets — from whom? Dangerous — for whom? Loyalty and responsibility — to whom? 2. New Scientist, September 10, 1970. 3. The (Newcastle) Journal, September 7, 1970. 4. New Scientist, September 10, 1970. 5. The BSSRS preparations for the B.A. meeting had not escaped the snooping attention of various interested parties. On August 5, 1970 a Mr. B. Rye, of Chemical Industries Association (Alembic House, 93 Albert Embankment, London S.E.1. — Tel. : o1-735 3001) had sent a letter and enclosure (both of which later fell into the hands of BSSRS activists) to Dr. H.D. Turner, Secretary of the British Association. The documents, later circularised (on whose authority?) by Dr. Turner to general officers and local sectional secretaries of the B.A., warned of the impending campaign of the BSSRS as if it were some kind of plot, and included potted dossiers on those thought to be the main plotters. Mr. Rye claimed that his information emanated from 'a Public Relations firm frequently consulted over press and publicity matters'. The report of Mr. Rye's 'Public Relations firm' contained such gems as 'there will be lots of very young graduates and students helping on the campaign ... they are out to cause lots of noise about ecology and the environment', and 'Jonathan R. is from the LSE. He is an "activist" and very left-wing. Anything he is involved in, in the way of demonstration, is likely to be noisy and not very pretty', etc., etc. 6. For background information about the RSGs, see Solidarity pamphlet No. 15 'The RSGs 1919-1963' by N. Walter. For information concerning the repercussions of the disclosures see 'Resistance Shall Grow', a pamphlet jointly produced in 1963 by the Independent Labour Party, London Federation of Anarchists, Solidarity and Syndicalist Workers Federation. 7. Among those chosen for survival (i.e. 'soldier-technicians' par excellence) were the following: Sir Harold Warris Thompson, CBE, Professor of Chemistry at Oxford University. Between 1952 and 1963 Harold was Scientific Adviser to the Home Office for Civil Defence (Southern Region); Dr Cyril Leng Smith, Director of Research (Radiotherapeutics) at Cambridge University. Cyril is a member of the 'Association of Radiation Research (Great Britain)' and of the 'Radiation Research Society (USA)'. He was one-time joint editor of a journal ironically named 'Radiation and Health' (written from the depths of an RSG? ); Professor Archibald Niel Black, MBE, of the Department of Engineering, University of Southampton. In 1964 Archie became Deputy Chairman of the Universities Central Council on Admissions. How many students know that a 'soldier-technician' has this kind of say on general policy in relation to higher education? 8. It was left to the local paper (The Journal, September 7, 1970) clearly to articulate Mr McLauchlan's fears. 'Rebel scientists were flinging defiance at the Official Secrets Act. They were appealing to colleagues to break the code-of silence surrounding military and other research work. ... They had drawn up a scientists' charter amounting to a Hippocratic Oath. ... They hoped that their bombshell, dropped right in the middle — of the B.A. meeting, would reverberate throughout the world and affect scientists in the USA, Russia and China, as well as Britain'. Exactly! 9. See 'Evening Standard', February 11, 1970.